Biophysical techniques allow capturing the mechanisms during the interplay between biomolecular entities on a scale ranging from the size of an atom (atomic structure, assembly mechanisms, protein-protein, protein-DNA, protein-lipid interactions) to the mesoscopic size of complex cellular objects (ribosomes, organelles, large macromolecular buildings, etc.). This workshop proposes to make an inventory of the latest technological advances and provides a theoretical and practical training on the main techniques of structural biophysics. It also aims at introducing integrative methodologies. 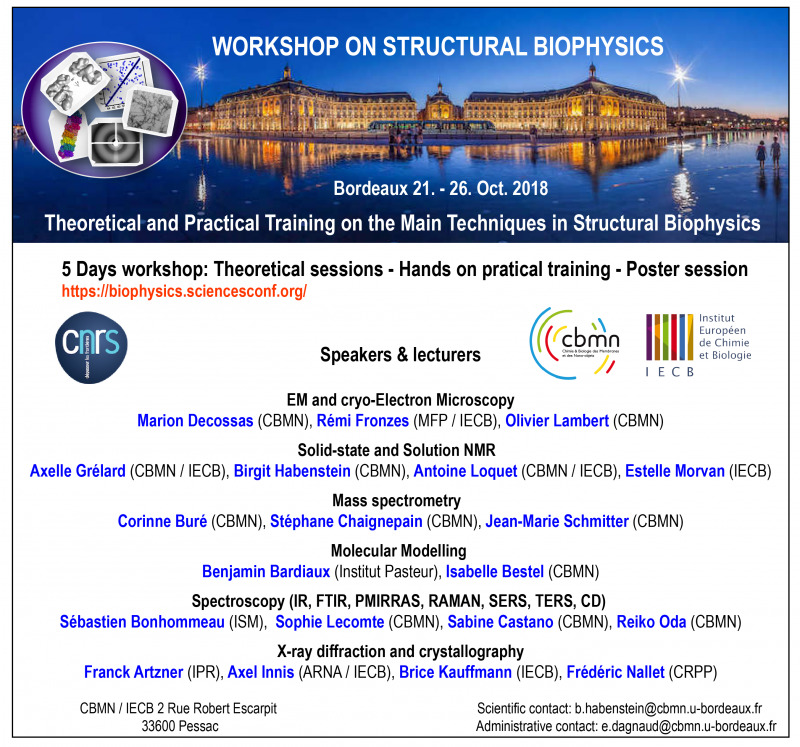 The workshop aims at providing a solid technological and methodological background to post-doctoral fellows, PhD students, research scientists and engineers for each technique and to demonstrate the power of each and the complementarity of the techniques. A poster session will give a great opportunity to communicate around science. The workshop language will be english or french, as requested by the candidates.